I’ve been going through some old notebooks, and found an account of a supper I had in 2005 at a crazy Chengdu restaurant called ‘The mess canteen 伙食团’. Its name was a reference to the mess canteens of the revolutionary era, and all the dishes on the menu were named after revolutionary slogans. So you could order ‘The fragrant grasslands 芳草地’ (a lettuce stem salad), ‘Years and years of peace 岁岁平安’ (stir-fried long beans with minced chicken), ‘Chaos 乱七八糟’ (stir-fried chicken offal), ‘Atom bombs 原子弹’ (meatballs), or – my favourites – ‘Fire-exploded embassy 火爆大使馆 or ‘Dry-fried embassy 干煸大使馆’. All the waiters and waitresses were kitted out in army gear, and announced the arrival of new guests with a loudhailer. 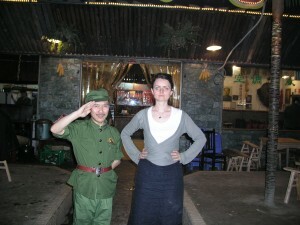 The boss (who you can see in the picture above, with me), was known as the ‘Village Chief’, and prefaced every sentence he uttered with a line from Mao’s little red book. The restaurant originally occupied a sort of shack in an alley opposite the Sheraton Hotel, but later moved to a new location (pictured). Does anyone know if it’s still there, somewhere? Ha ha ha! I guess uniquely themed restaurants are a far east thing. In the city where i live (in Japan) there are such crazy restaurants like the Christmas restaurant. I’ve never personally been there myself, but I’ve heard it’s very interesting. I think you’d recognise the ‘Village Chief’ if it was the same one! Yes, I remember this fellow – he originally was in a shack down an alley off Renmin Zhonglu opposite the soccer stadium – in Yanshikou before they demolished the neighborhood for something else; I lived upstairs in an apartment from his place… Very interesting and yummy restaurant concept, even if a bit more pricey than other things for offer in the neighborhood. If I recall, the hongzhadashiguan (red-cooked pig intestines) didn’t work for my palate, but the baijiu pickled with herbs/spices was in fact quite nice.